We've tried to cover the basics here but if there's anything you would like to ask or need help with do just send us an email at info@popvillas.net and we will do our very best to answer any and all questions. Remember, with your booking you get access to your own private concierge service so they can help answer any questions and organise any activity or service for you. Koh Tao has grown into a regularly serviced island so getting here is no problem at all. The two main boat companies (Lompraya and Seatran) have big spacious passenger ferry's that service Koh Tao from Surat Thani, Chumpon, Koh Samui and Koh Phangan a few times daily. Best booking sites are www.ferrysamui.com or www.islandtravelkohtao.com. Lompraya is a little more expensive but is the more comfortable and faster option. Once on the island most tourists get about on scooters, your concierge can arrange scooter rental for you, but we do recommend taking out insurance with our supplier when they offer it just in case you do cause any damage to the bikes. Koh Tao has a bit of a reputation for charging cheap bike rental prices and then claiming extortionate fees for small scratches so we do our best to make sure you avoid this unpleasant experience! We have a dedicated taxi driver at POP Villas with agreed rates for you to use whenever you like. Taxi's unfortunately are more expensive here than other islands and even though our island is small, most journeys cost around 400 Baht. Elsewhere on the island they may try to charge more, especially at night but with our driver you will always have the agreed rate. His number is programmed into your villa mobile, he speaks English and he is always smiling! You are simply spoilt for choice on Koh Tao, as well as having gorgeous inexpensive local Thai food, we also have a vast array of restaurants from every corner of the globe. Japanese, Italian, French, Spanish...all up to international standards which sets Koh Tao apart from other islands. We also have a great selection of detox and health food cafe's. Check out Koh Tao Foodies on Facebook and have a little preview! Of course staying at POP Villa's with our spectacular views and beautiful dining areas its always a good idea to eat in, and while there are plenty of restaurants that deliver on the island we can also organise a private chef for you for those extra special evenings. Each of our villas have safe and clean drinking water in coolers provided for you for when you are at home. However when you go out you must ensure you keep bottled water with you at all times as you must keep hydrated in this hot weather. Tap water is not safe to drink. Water in general is in very short supply on Koh Tao so we ask that you use it responsibly in the villa and in fact anywhere on the island. Shorter showers, flushing toilets only when necessary and generally being conscious whenever you turn the tap on...it all helps. There are Banks and ATM's on the island and you shouldn't have a problem withdrawing money using your credit or debit card, although Siam Commercial Bank (the purple one) accepts more international cards than the others. There is usually a charge of between 100THB to 200THB every time you withdraw money and normally a maximum of 10,000THB a transaction. Most of the dive centres and the bigger resorts accept credit cards but there will be a 3% charge added. Exchange rates change often so its worth checking www.xe.com to see where you stand! Koh Tao has medical centres with at least 1 or 2 doctors and nurses on site at all times that can treat most medical problems immediately and with minimal cost. The pharmacies on the island are well stocked so you should find any mainstream medicines without a problem. Small medical treatments are very affordable but should you need any serious medical treatment, the costs can get very expensive so purchasing Travel Insurance prior to travel is advisable. There is a never ending list of things to do on this island and we are here to make sure you get the absolute best of it! Kayaking, Paddle Boarding, Snorkelling, Scuba Diving, Free Diving, Spa, Yoga, Boxing, Trapeze, Thai Cooking School, Hiking...or just Sunbathing next to your private pool...check out our services page or send us an email at info@popvillas.net if you would like us to organise anything for you. Its absolutely possible and with our wonderful Wedding Planning services provided by Forever Lovestruck its much much easier than you think. Destination weddings are their specialty and they do it exceptionally well. "From the smallest detail to the grandest moment, our passion is to create the most beautiful, memorable weddings possible." As we are protected by the elements tucked into the Gulf of Thailand, we are pretty lucky when it comes to weather and enjoy a much longer season than the rest of Thailand. Our rainy months tend to be around November but as our climate is tropical, when it does rain it comes in thick and fast and is usually on its way after an hour or so. So even in our rainy months its usually pretty sunny most of the day! January & February: Lovely sunny and warm comfortable weather, averaging around 29C /85F. The visibility in the sea is particularly good at this time of year. March, April & May: Guaranteed sunshine and lovely hot days averaging around 32C / 89F. This time of year is particularly special as we celebrate Thai New Year (Songkran) in the week of April 13, this is a huge water festival and everyone gets involved! To really see what its about take a look at some pictures here. June, July & August: This is low season in the rest of Thailand as the wind turns and starts blowing, but as we are protected in our Gulf we are the lucky ones with the beautiful sunny weather! If it does rain it normally only lasts for half an hour or so and then the sun comes back to shine on us. This is a great time of year to see turtles! September & October: The temperature drops slightly averaging around 28C/ 82F (Brr! ), its a beautiful time of year and often the time divers see Whale Sharks. November & December: This is our rainy season but we don't have days and days of rain comparable to the Andaman coast, each day the sunshine comes and goes with bursts of rain that never last too long, and some days we are still blessed with constant sunshine. In November especially the island is blissfully quiet so if you're looking to avoid the crowds and benefit from low season prices now is the time to come! December starts to get busier of course with the holidays and the rain usually does us a favour and leaves towards the end of the month ready for a sunny Christmas! Our island is run on generator so sometimes it does come and go! We try to be mindful when we use it as we are sharing with the whole island, so please do not leave anything on when you leave the villa. POP Villas is not a party villa, but that doesn't mean we can't tell you where to find the best party spots on the Island! For a full list of Festivals and Events click here. You can't really say you've partied on Koh Tao until you've tried the KOH TAO PUB CRAWL. Buckets at the ready, matching T Shirts in hand...get ready to have a massive laugh exploring the island bar by bar! 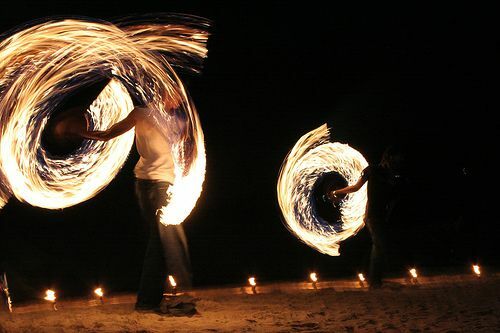 For a little less touristy and more of a club night try the not so secret Secret Party Koh Tao, click here to find where and when the next one is on...it mysteriously moves about as secret parties should! For Parties and Events on our neighbouring Koh Phangan make sure you check out Phanganist for a full list of whats on.